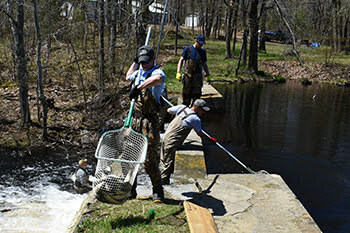 DMR Sea Run Fisheries Division staff members lift alewives over the dam at Lower Togus Pond. AUGUSTA — The Maine Department of Marine Resources has been awarded $311,357 from the National Oceanic and Atmospheric Administration’s Species Recovery Grants to States Program to restore Atlantic salmon and river herring in Togus Stream. The three-year restoration project will involve Atlantic salmon egg planting at three locations in Togus Stream, installation of a fish way at Lower Togus Pond Dam, and removal of two small stone dams located downstream of Lower Togus Pond Dam. Improved river herring runs provide numerous benefits including the increased available of food for predators such as eagles, osprey, and striped bass during juvenile salmon outmigration to the ocean, which improves the chances of survival for salmon juveniles. “Stocking eggs into a river has proven to be a successful way to promote recovery of Atlantic salmon. Access to habitat is equally vital for restoration of species like Atlantic salmon and river herring which spawn in fresh water and migrate to and from saltwater,” said Ledwin. The dam, built in 1804, blocked Atlantic salmon and river herring from migrating upstream to historic spawning habitat. To rebuild the river herring population in the pond, DMR staff began stocking it in 2010, and in 2014 began manually transferring returning river herring over the existing dam with hand-held nets to facilitate migration. Two stone dams downstream of the Lower Togus Pond dam which impede fish passage during lower water levels will also be removed as part of the project. The Department also credits previous Sea Run Fisheries Division staffer Melissa Laser, who died in 2010, for laying the ground work for this project by conducting extensive outreach with local landowners. “Melissa’s work was critical in helping local landowners appreciate the many benefits of a healthy river herring population,” said Commissioner Keliher.